Dunscar Farm Bed & Breakfast01433 620483work Guest AccommodationA warm welcome awaits you at Dunscar Farm, our family run farmhouse in the heart of Derbyshire's beautiful Peak District, situated on the outskirts of Castleton in the Hope Valley, set at the foot of Mam Tor. At Dunscar we offer a relaxed farmhouse atmosphere that is an ideal home for walkers, cyclists, anyone who loves the outdoors or even if you just want to go sight-seeing. Start the day with a choice of fruit juice, cereals, yogurt, prunes, grapefruit and fresh fruit salad, followed by a traditional cooked breakfast (vegetarians catered for) served with toast and preserves, a pot of tea, or cafeteria of coffee. Our five rooms including ground floor rooms suitable for the less able offer a comfortable base to relax after a day’s walking or sightseeing and in the fine weather you can relax outside in the garden enjoying the wonderful views. Ample Parking is available along with wifi and tea and coffee making facilities in every room. The Farm was established in 1700 and is kept in permanent pasture, essentially given over to sheep farming with local farmer Gary switching from cooking your breakfast in the morning to tending to his sheep later in the day with the help of his son Steven. Visitors in April may even get the chance to see the spring lambs being born. 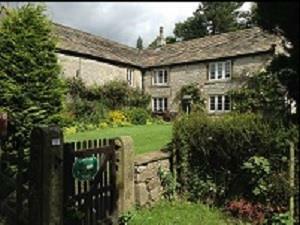 Well situated on the outskirts of Castleton, just a short drive/walk to the village. Castleton had much to offer with its castle and show caves - Peak, Treak Cliffe, Blue John and Speedwell, numerous outdoor shops, gift shops and cafes. The village is also home to 6 pubs so there’s plenty of choice nearby for a cosy evening meal or night out. Visit world famous Chatsworth, or Haddon Hall, a perfectly preserved Medieval Manor House, take the chance to see Bakewell, home of the famous "Bakewell Tart", where on Mondays there is a popular market well worth a visit. Enjoyed an excellent stay at a perfect location.